Cold therapy can be an effective treatment for inflammation, pain and swelling if applied early in the disease process. Cold therapy inhibits the mechanical, physical and chemical actions of pain and inflammation. Cold therapy can be applied using ice and gel packs which can be purchased commercially. Homemade ice packs, towels and cold-water soaks can also be used. Cold therapy is best used within the first 72 hours of the injury or surgery. Cold therapy works by shutting down blood flow to a damaged area, which minimizes leakage of fluid, thereby reducing swelling. Cold temperatures inhibit cellular chemical function making it effective in preventing the damaging effects of inflammation. To prevent excessive cooling, application of cold therapy should be limited to multiple short sessions (5-15 minutes four times daily). It is best to improve comfort of this application by placing a pillowcase or towel between the cold source and the skin. Cold therapy should not be used in debilitated animals, animals with low body temperature, or animals with circulatory disease, diabetes or pressure sores. IVDD can occur acutely. Acute expulsion of the intervertebral disc causes intense inflammation of the spinal cord, spinal nerve roots and ligamentous structures of the vertebrae. Cold therapy applied directly to the affected disc area can be effective in reducing the impending swelling. In cases of thoracolumbar disc disease, the pet may be seen to jump off furniture and scream or yelp. There may be pain over the middle of the back or the pet may have a hunched appearance. The application of a cold pack over this area may prevent significant swelling in the spinal canal, thereby reducing the amount of spinal cord damage from the event. Homemade ice packs (alcohol, water, ice slush bags made with ziplock bags containing crushed ice and rubbing alcohol) are more effective than gel packs or gel beads purchased commercially. Apply the ice pack over a wet or dry towel between the skin and the cold pack. Apply for 15 minutes every 6 hours. Heat therapy increases blood flow, blood vessel permeability and cellular chemical reactions. Heat stimulates inflammation and invigorates wound healing. It also relieves pain, relaxes ligaments and tendons, and decreases muscle tension and spasms. Heat can be applied using hot packs, heat lamps, warm towels, warm-water blankets, therapeutic ultrasound, laser therapy, warm-water baths and hydrotherapy units. Heat can be applied for 15 to 20 minutes, two to four times a day. It should be used after post-injury swelling has subsided, which is usually 48 to 72 hours after injury or surgery. Heat therapy is effective only at a certain range of temperatures (104 – 113°F). Below this range, it is not effective and above, it can be harmful. Hyperthermia stimulates the same nerves of the skin as TENS and Acupuncture, resulting in activation of the Gate Control Theory of Pain. This theory postulates that activating a series of nerve fibers in the skin can inhibit other nerve fibers traveling up the spinal cord to the brain. Active stimulation provided by heat therapy reduces pain sensation. This stimulation also causes the release of opioids from the spinal cord and brain. The combined effect of decreased pain, increased circulation, and earlier mobility result in improved healing. Hot packs are the most effective mode for applying heat. They include many forms, from canvas bags filled with cracked corn, beans, silicate gel, or other inert materials; electric heating pads, damp microwaved towels; or circulating water blankets. Infrared lamps give off heat and can be used for heating larger areas of the body. They should be positioned 15 to 24 inches away from the pet. Any form of heat should be tested by placing your hand under the heat lamp or hot pack for several minutes to see if it is too hot. A pet will try to move away from a heat source that is too hot. 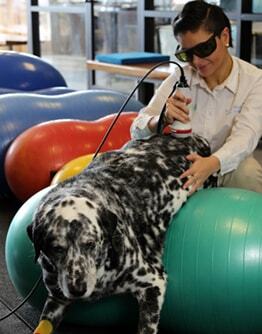 Heat therapy should be used with caution in obese pets, pets with poor circulation, or pets with poor heart function. Pets with Intervertebral Disc Disease (IVDD) can benefit from heat therapy 72 hours after the event or surgery. Localized heat to the area of concern should be applied for 15 to 20 minutes four times a day. Massage therapy and passive range of motion exercise is good during and after the heat therapy. Passive range of motion (PROM) exercises external force such as your hands used to move a limb through its range of motion. The range of motion refers to the controlled movement of the limbs and joints in flexion, extension, adduction (moving the limb toward the body), and abduction (moving the limb away from the body) by you, with no effort being exerted by the animal. Goal is to stretch and manipulate the structures around the joint. PROM is not a replacement for normal weight bearing or voluntary active movement. PROM should be instituted immediately after surgery, trauma, or event that renders the limbs ineffective. PROM should be continued until the patient begins to walk normally. PROM is performed with your pet relaxed and laying on its side. The joint or joints are flexed or extended to the point that there is resistance without pain, and held for 10–30 seconds and returned to a normal position as if the pet were standing. These cycles are repeated for 10–15 complete cycles of flexion and extension. Caution should be taken not to overstretch the joint tissues. PROM with too much force may tear the structures supporting the joint. 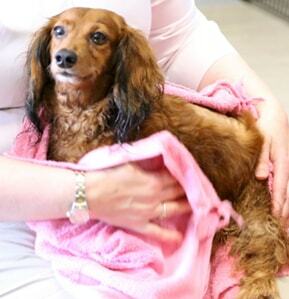 IVDD pets with neurologic disease need PROM to reduce muscle atrophy and improve blood flow. Most important, though, are the neurologic signals that are sent from the paralyzed leg up to the spinal cord, then to the area in the spinal cord where the compression or damage is. These damaged nerves will receive the movement signals generated by PROM causing them to secrete chemicals of healing; chemicals that attract and activate local stem cells to heal the spinal cord. PROM and other therapy modalities that improve muscle, nerve, and spinal cord communication enhance the likelihood of a successful outcome for your pet. The effects of massage are both mechanical and neurologic. The neurologic effects are due to the stimulation of the nerves in the muscles and skin that connect to the brain resulting in the release of opioids and other neurochemicals that cause relaxation. The mechanical effects are due to increased fluid and venous blood drainage removing swelling and metabolic waste along with increased arterial circulation, which enhances tissue oxygenation and wound healing. Physical manipulation of scar tissue increases range of joint motion. This involves the manual or mechanical manipulation of soft tissues and muscle by rubbing, kneading or tapping. Massage techniques in pets are similar to human massage. Effleurage –(Latin, effluere, “to flow out”) is a form of superficial or light stroking massage, and is generally used in the beginning of all massage sessions to relax and acclimatize the pet to gentle touch of the area. Pétrissage –Deep kneading and squeezing of the muscles and surrounding soft tissues. Cross fiber –Cross fiber is also a deep massage that is concentrated along lines of restrictive scar tissue and designed to promote normal range of motion of the joints. Tapotement –Tapotement involves the percussive manipulation of soft tissues with a cupped hand or massage equipment and is most commonly used to relax spastic muscle contraction or enhance postural drainage for respiratory conditions. Instances when massage therapy should not be used include unstable or infected fractures or tissue, and the direct manipulation of a malignancy. In most instances, massage is an indispensable therapy when animals are in intensive care and have restricted mobility. IVDD patients enjoy properly performed massage. Start with your pet lying on its belly on a soft pillow or bed. Begin stroking initially to relax your pet, starting at the head and working toward the back. When stroking, start at the body and move toward the foot. Place the entire hand in contact with the skin of your pet and maintain a gentle but firm pressure. Once your pet is relaxed begin effleurage. Effleurage is usually the beginning of the massage and the end of the massage. It is used to remove tissue fluid that builds up because of inactivity and to stimulate circulation. If you know the anatomy of the lymph nodes, you should move your hands in the direction of the lymph nodes to stimulate drainage of fluid. Effleurage is also a diagnostic evaluation of the tissues to assess for tightness, spasms or scar tissue and the need for additional massage techniques. Begin at the lower end of the area. or at the foot and move toward the lymph nodes. You may use both hands, one hand, or your fingers, depending on the size of your pet. Contact the skin and apply even pressure to sink into the tissues under the skin. Make a sweeping movement to the top of the area or limb, molding your hands to the contours of the body and maintaining the same depth of pressure. Bring your hands towards you as you work using the heel of your hand. Keep your fingers and palm in contact with your pet. Overlapping strokes are used, continuing until the entire body or area is covered. Pétrissage is a compression and or wringing movement that can be used all over the body, but is most effective on large muscles. Begin at the area closest to the center of the body or at the top of the limb. Contact the skin and press into the tissue. Continue to move toward the foot or away from the center of the body. The skin is moved over the underlying tissue in a circular manner, bunching up the skin on one side and tightening the skin on the other. Pressure is applied to deeper tissues, similar to the effort used to open child proof bottles – push down and twist. If both hands are being used on a large area they go in different directions, right clockwise and left counterclockwise. Wringing is another form of Pétrissage, and is applied using both hands. One hand brings the tissue toward you, the other moves it away. Hold this for 5 seconds, then slowly release. The hand then moves up the body or limb to perform the wringing on the adjacent tissue. Cross Fiber or Deep Transverse massage is done over areas of scar tissue formation. Scar tissue forms within muscles because of injury. Deep pressure is applied with the tip of the thumb or fingers. The tissue is compressed to the depth of the scar tissue. Small rotary movements are performed on the deep structures while maintaining constant pressure. This is repeated 10 times and performed in sets of 3 to 10. Percussion or Tapotement is used to stimulate circulation, provoke reflexes, provide gentle stimulation, stimulate muscle tone, or assist in clearing airways of congestion. Clapping, Hacking and Pounding are all techniques that feature light percussion on the skin and outer tissues of the pet. Clapping is done with a cupped hand applied like slapping to trap air between the hand and skin. Rapid light, brisk strokes are used over the entire area. Hacking is like a karate chop, with the border of the little finger striking the pet. Both hands are used lightly and rapidly, moving at the wrist over the area. Pounding uses loose fists which strike the skin alternately and rapidly. Gentle Effleurage and stretching is used to finish the massage. Did you you notice the dog exercising above only has 3 legs? Exercise is being recognized as an important part of rehabilitation, and the earlier the better. Controlled active therapeutic exercise may be safely performed when closely assisted and attended to by the therapist or the attentive owner. The benefits of therapeutic exercise are abundant. Exercise helps build strength, muscle mass, agility, coordination, and cardiovascular health. In addition, therapeutic exercise may be used as a preventive measure to improve general health, reduce obesity, and increase performance in all pets. Prior to initiating therapy, all animals must be fully evaluated and assessed by a veterinary rehabilitation specialist. 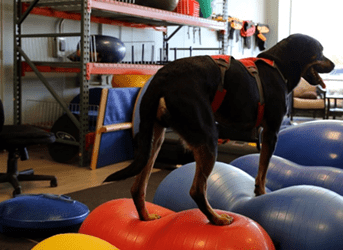 When performed appropriately and in consultation with the veterinarian or rehab specialist, these activities can be performed early in the postoperative recovery period and modified and intensified to promote cardiovascular and musculoskeletal fitness.